Raising awareness of the complex topic of climate justice, its causes and consequences and the responsibility of humankind towards creation are the issues tackled by a statement, which was developed and adopted by the participants of the EYCE and WSCF-E study session “Climate Justice Now!”, which took place from 12th – 18th of September 2010 in the European Youth Centre, Strasbourg, France. 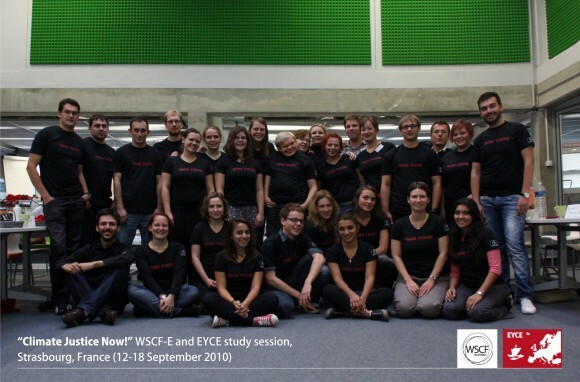 The study session was organised in cooperation with the World Student Christian Federation Europe Region (WSCF-E) and the Directorate of Youth and Sport of the Council of Europe and was an event directly following up the mandate of the EYCE General Meeting in 2009 to address environmental issues in the work of EYCE. It precedes the three year EYCE Campaign to promote Ecological Justice, which will be launched in 2011. The study session brought together more than 24 participants from all over Europe and beyond, with different cultural, social and denominational backgrounds, creating a unique and diverse basis for discussions on the ecological situation in various countries, and the role and responsibility of young Christians in these situations. During the study session inputs of three different guest speakers provided the overview of the themes discussed from various aspects – legal, theological and practical. Lawyer and Human Rights expert Cosmin Corendea from Romania gave an overview of the legal situation concerning climate justice and sustainability in the European Union. WCC’s Working Group on Climate Change member Ilkka Sipiläinen from Finland presented various projects and campaigns practised in different European countries, fostering projects of the Finnish Lutheran Church. The Rev. Peter Pavlovic, staff member of the Church and Society Commission of CEC, gave an overview of the theological aspects of Christian responsibility towards creation and the concepts of eco-theology. The participants acknowledged the strong need to promote climate justice as a Human Right and developed a common statement calling for more awareness and action. The statement highlights rethinking our excessive consumerism and the consideration of alternative ways of life. It also points out the need for the improvement of climate education involving all parts of society as being a crucial part of the change. The statement claims the recognition of climate refugees as an official category in the UNHCR-statutes. Participants contributed actively to the process of the study session with their experiences and knowledge of the subject, and enriched the atmosphere of the event greatly with their creative approaches to the activities.